Do you feel stressed and flustered by an overwhelming to-do list? Do you often feel distracted by what seems like a million things demanding your attention? Despite being busy all the time, do you feel like you’re getting nowhere? If so, you’re not alone. We all have the same 24 hours in the day. To get the most out of your time — doing more of what truly counts in less time — try these 7 simple tips to be more productive. In this episode of BioTrust Radio, Shawn and Tim talk about the difference between being busy and productive, and with a big assist from David Miller and his super article on getting more done in less time, they’ll reveal a list of strategies to help you be more productive — at work, at home, and in life. What it actually means to be more productive and the critical difference between being busy and being productive. Why short breaks are NOT a waste of time; they are one of the most effective tools to be more productive. Tip #1 to Be More Productive: Prioritize Your Work. Multitasking IS a waste of time for most people, and it’s not an effective tool to be more productive. Learn how to delegate. Use the Eisenhower Box (below). Tip #2 to Be More Productive: Schedule Your Tasks Smartly. Set realistic expectations for yourself. Instead of trying to more tasks, work on the one(s) that counts, and do it very well. Every choice has an opportunity cost. Tip #3 to Be More Productive: Use Technology to Help. Be mindful of your time (and how you’re spending it). Tip #4 to Be More Productive: Reduce the Transition Time between Tasks. Use your time between scheduled tasks mindfully. Take short breaks between tasks. Tip #5 to Be More Productive: Eliminate Interruptions While Working. Be mindful of your time; it’s precious. Are you constantly getting bombarded with notifications? Do you always have your email browser open? Tip #6 to Be More Productive: Batch Similar Tasks Together. Whenever possible, put similar tasks together (email, phone calls) to reduce transition time. Tip #7 to Be More Productive: Conduct Meetings Effectively. Honor and respect others and their time. “To be early is to be on time, to be on time is to be late, and to be late is unacceptable. We’ll discuss what it means to be more productive, take a deep dive into these 7 productivity hacks, and much, much more…Enjoy! Shawn: Hey BioTrust Nation, we are back with another episode. I’ve got Tim Skwiat, my partner in crime, in house. Shawn: [chuckles] And we are going to get into a list, which we’re loving lists lately. But this one’s really cool, 7 Easy Productivity Hacks That Will 10x Your Output. And who doesn’t want to be more productive and be 10 times better. And productivity hacks are huge. There’s a life hack, life hacker? Life hacker, I think is like a big website for that. But, you know, we’re hearing a lot about bio‑hacking and life‑hacking and improving your output and productivity and being a high achiever, and getting more from less, and The 4-Hour Workweek, and all these kinds of things. Shawn: [laughs] You know, just like being literally focused. Tim: How would you define productivity? What does it mean to be more productive to you? Shawn: I think productivity means—that’s a great question. I would say that it means getting the most out of your time. And I would say it’s not only the most out of your time, but the most out of the least amount of your time. Like just being effective. And it doesn’t have to be—as a matter of fact—like The 4-Hour Workweek kind of thing, it doesn’t have to be across a long period of time. I think it can be a very short burst, but you use it and you ride it effectively. Tim: Yeah. So would you say that there’s a difference between being busy and be more productive? Tim: Productivity is not just about checking things off a list or just feel like you’re go-go-go all the time. In fact, that could be counterproductive. Shawn: I agree. And the busy thing, I think is certainly a strong point of confusion, because someone will say, they’ll justify and say, “Look, I’ve been working all day. I’m busy all day. I’ve been going all day. I’ve been stressed.” And certainly when you’re dealing with notifications and distraction, like it can create a stress in and of itself because you feel flustered, you feel confused, you feel overwhelmed because there’s so many things coming from so many angles. And we’re seeing now that there’s apps that you can use on your computer that essentially shut off your internet access. Or there’s things on your phone—that we’ve talked about—that turn off notifications, push notifications. There’s different things out there that allow you to just focus in on one thing, one thing only, and do it well for 15 minutes, 30 minutes, maybe an hour. Shawn: I think once you start getting beyond an hour, I don’t know how focused you can be on that one thing. Like I think at some point you need to redirect and do something else. Go take a walk, get up and stroll around, maybe get a snack, or you don’t want to just stress eat or something, but it could be like celery or something. It could just reactivate your brain. But you need to do something else. It could be read a book for a minute. It could be watch a 30-minute episode of The Flash or something, and something that’s fun and goofy and creative, and then you come back and you’re able to be more productive. And most people would say, “Oh, that’s slacking.” You’re not staying busy, like you’re wasting time. Oh no. That is so wrong, per the data now. Like that is so wrong. If you’re just staying busy all day long, you’re never getting in the zone. You’re never really that productive. Shawn: So I’d rather have short bursts of you at your best, you at your most creative and plugged in, and most intelligent, cerebral, then a whole day of busyness and distractedness and never really accomplishing much of anything of quality. Tim: Yeah. That’s super. I love that some summation there. One thing that I’ve been working on, personally, is I’ve noticed that. That I have to do a lot of writing, or I do a lot of writing for BioTrust. I just noticed that like I hit that point where I just feel like I’m not flowing as consistently as I was, and I used to fight it. Like just get through, get through it. And sometimes I would, but now what I’m experimenting with is taking those 10 to 15-minute breaks, like you talked about. And even though it’s like really hot in Texas right now, over 100 degrees, what I thought was like, you know what? I’m going to go out and I’m going to take my shirt off and I’m going to get that 10 or 15 minutes that I need of sun exposure to boost my vitamin D levels. And it’s incredibly energizing to be in the sunlight. I work from home, so I don’t work in an office, necessarily. So I don’t have to worry about taking a shower and things like that. But I come back in and I’m like, “Let’s go.” And sometimes I might listen to a podcast, just to kind of get my mind on a different train of thought or something like that. But just to break it up, like you talked about, has really been helpful. And then I come back in and can get back into things. Yeah, just going back to your point about multi- versus single-tasking, in my experience, very few people are very efficient multitaskers. And so, like you said, focusing on that one thing at a time is much more effective and efficient. And every time you try to multitask and switch from one thing to another, there’s some there’s some time that’s wasted. For your mind to shift from the one thing that you were working on to the new thing, and basically, you’re leaking productivity, you’re leaking energy. Shawn: Right. And I think that when you are in a mindset where you’re learning or you’re plugging into something creative, like when you’re listening to a podcast, when you’re even—like I said—just watching a funny, cool version of The Flash, that’s kind of sci‑fi and fantasy. Shawn: You know, it takes your mind to, call it a childhood place or an imaginary place, and imagination and creativity is where your brain has fun. Two very different mindsets, right? Tim: Yeah. Love it. I love it. Shawn: And when you’re in that fun state and, yeah, you might take some breaks here and there to do that, but think of them instead of just slacking from work, think of them as re-energizing your work. Tim: Yeah. I love that. Shawn: You’re literally plugging in, like your phone and you see that battery go from the bottom to like topped off. That’s what you need to do with your brain. When you’re starting to run low on ATP and creativity, then it’s time to recharge. And you know, you’re doing it out in the sunlight. You can do it with—like I said—walking around, chomping on some celery or watching a fun show, or reading like a quick book, you know, just a chapter or something. Or listening to a podcast or whatever you enjoy and you look forward to, build those things into your day so you look forward to your day. Shawn: And then you start associating work with fun. Tim: Yeah, I love that. Build it into your day. Yeah, looking forward to it. And even maybe having a conversation with somebody. Tim: Yeah, it’s just a different part of your brain and like you could—not everyone, but a lot of us get energized during conversation. Shawn: I do with you. Tim: Yeah, and likewise. I was just going to say it. It really makes me feel good and wants to get back to it. And giving that one area of your—not necessarily giving the area of your brain a chance to rest, but giving that side of things a break, can actually spark the creativity. Like you said, to get back and like, “Wow, you know, I left that for a second. I have a great idea now that I can add to that,” or to overcome that problem. Tim: Anyway, awesome, awesome intro into this, I think, this list here. I like prioritizing quite a bit. And there is this Eisenhower box that he brings up, and I’ve seen this before and it’s a phenomenal graphic. If you guys haven’t seen it, we’ll put it in the notes because you really need to see it. So, let me describe it. It’s four boxes and like a quadrant, essentially, that’s set up. And so you have, across the top you have, going from left to right URGENT and NOT URGENT. And then in the vertical axis you have, at the bottom NOT IMPORTANT and then IMPORTANT. So, then you have this quadrant that includes not important-urgent, NOT IMPORTANT‑NOT URGENT. Then you have IMPORTANT‑URGENT, IMPORTANT‑NOT URGENT. And then you look at these boxes, and when you have important and urgent, that’s what you prioritize. Do it, do it now. And he gives an example of write an article for today. Under important‑not urgent -> DECIDE. Schedule a time to do it. And he gives an examples like exercising, calling family and friends, researching articles, long-term business strategy. Then we get down to these ones that are crushing you and wasting your time not importanT-urgent. Man, if you can get this down, like this is a huge one. But you need to be smart about having the right people around you and feeling comfortable reaching out to those people. And this is where there’s like a lot of services, like there’s virtual assistants, there’s all kinds of consultants, there’s all kinds of services now that you can tap into online to help you with things. And you’d be shocked at how much better you could be. Yes you’ll spend a little money, but you’ll be shocked at how much better you could be at using them. And it’s delegate in this box. So, not important-urgent ->delegate. Who can do it for you? Scheduling interviews is an example he gives. Booking flights, approving comments, answering certain emails, sharing articles. These are things that they need to get done, but you don’t need to be the one to do it. Shawn: It’s wasting your time. Your time is too valuable. You should be working on important-urgent. Then the other one, the last quadrant, is NOT IMPORTANT-NOT URGENT. Now this one is really killing you, if you’re wasting time in this box. He says the going from top to bottom, it was DO, DECIDE, DELEGATE. This one’s DELETE. Tim: Get rid of it. Shawn: Eliminate it. Watching television, checking social media, sorting through junk mail. I would say you have to like DELETE these, if they’re part of your life that you enjoy. The examples he gives, I would say, are things that you might want to schedule, limit, and put in a place where it’s not affecting your productivity. So, we talked about that before, like this could be something that you schedule for fun, that gets you back to being productive. So I don’t think that all these need to be eliminated, in the case that he gives, but certainly if it’s not important‑not urgent, then you need to put it in its box and recognize it for what it is, and that it’s probably an efficiency-waster unless you’re using it correctly. And that’s my point. Like these you don’t have to be bad, you just have to recognize them for what they are, strategically use them and if it is a recharger for you. If it’s a recharger, then it does have strategic purpose and they don’t need to be eliminated. So that would be my only caveat there. Tim: Yeah, that’s awesome, Shawn. And I think kind of what, what we’re saying there toward the end, too, is I just think this is a really useful tool to be more productive is to be mindful of where you’re on your time, right? Tim: So, like you said, it’s up to you to decide what’s important and what’s not important, but just starting to be more aware of where your time is being spent and perhaps being leaked. I think that’s a big one. So, this is like this bucket system, with Eisenhower Box. That’s one way to do it. My wife also has a really cool bucket system that I like to use. But when I say buckets, like there’s four buckets here. Well, she has three buckets. You have a HAVE‑TO bucket, you have a NEED-TO bucket, and then you have a WANT-TO bucket. And you can really assign everything that you feel like you need to do or on your to-do list into one of those buckets. And so, the HAVE-TO bucket would be like the same thing here as the IMPORTANT and URGENT. That’s the top priority for the day, or whatever. And the NEED-TO would be the things that you move on to next. And then the WANT‑TO is like if you have extra time to get in there and do it. Shawn: That’s a great system and it fixes maybe that one area that I was getting a little hung up on. Shawn: But the one area that doesn’t address is the DELEGATE. Shawn: And I really feel like that’s where a lot of people fall short. Like I think deleting some of these things, like that’s something that you can quickly address. You’re like, “Yep, that one’s hurting my productivity. I’m going to get rid of that. I recognize that.” But telling someone they need to DELEGATE, that can often be very difficult because they just might not feel comfortable: one, finding the source to delegate to; and then two, asking for that help. Shawn: Or interviewing those people, or taking the time out to make yourself long-run more efficient, but short-run you’re getting less efficient. Shawn: Because you’re taking time out. But ultimately, this is going to make you so much better because you’re not going to be as distracted, you’re not going to be spending times on things you don’t like, you know, things that are just mundane to you. If they’re mundane and you’re not tapping into your best and your most creative, then you really should be getting these off your plate. Shawn: Finding ways to get these off your plate. And like I said, there’s so many services now. You don’t have to be someone who’s rich. You don’t have to be someone who’s like VP and have some executive assistant. There’s literally like things, like it might be $10 for the day to send something off. Like there’s all these services. And maybe we can find a few to put in the notes. Shawn: Where people can just look to these things. And now there’s like there’s even more like these assistants on your phones that you can add to help you be more productive with your time, that are getting smarter and smarter and smarter with like Google Assistant, Siri, Microsoft has Cortana that’s built into Windows 10. They’re getting more and more Ai machine learning, like smart, like in terms of like if you say, “Hey Google, wake me up at such-and-such. Hey Google, schedule a time for me to get a haircut on Tuesday, that works with my schedule.” And now it looks at your schedule. Shawn: So, they’re getting better and better and I think maybe in the next five years maybe you won’t need a virtual assistant, executive assistant. But there’s all kinds of services now. Like there’s transcription services, like we use. There’s people like that edit this podcast for us. There’s people that we can use, that help us get some things done that yes, we can do it ourselves, but it’s zapping our productivity and we need to be at our best and focus where we’re in our zone. Tim: Yeah. Just to add on to that, the DELEGATE side of things, too. Not just work‑related, but life‑related, that also opens the doors to other areas that are important to you. So, we took the plunge and we use a grocery delivery service. Tim: Which maybe adds about 10% to the bill. Maybe. So, if you can afford it. It’s worth it for me because what it does for me probably each week, is it gives me about three to four extra hours that I can spend working on things that matter or spending time with my family. Another thing that comes to mind, you have meal delivery services and things like that, where if you have trouble preparing healthy foods and things like that, or you want to claim some that time back. So there’s things outside of work that we can explore also. Shawn: You know another awesome thing about that is you’re helping people work. Shawn: You know, you’re like thinking, “Oh, this is awkward. Like I can do it myself. I don’t know that I should get someone to do this.” And man, you’re like helping the economy. You’re literally helping people in your community to get things done, to have income. Shawn: So, that’s a good thing, too. I mean, to me, that feels good when you connect with other people and you’re helping them and they’re helping you. Tim: Yeah, I’m glad that you mentioned that too because work-related-wise, I personally and I know I’m not alone when I say this, but I have difficulty delegating responsibility to others. Like I just don’t like asking people to do things for me. I can do it. Why should I have to ask them? I don’t want them to feel bad. But what I’ve realized, and the other thing like you said, is that it takes a little bit of time sometimes to train someone or teach someone how to do it the first couple times. But what I’ve realized is that asking someone to do something for you is incredibly empowering for that person. It’s like, “Wow, that person really trusts me to do this. That really means a lot to me and now I’m learning a new task that feels good.” So, if you have a hard time doing it internally, think of the external consequence in the sense that you’re actually helping someone move along their path, you’re helping them feel better, and you’re actually improving that relationship in terms of increasing the level of trust. Shawn: You’re also vocalizing something that like I need help and where that could like spider‑web across your life. If you’re not vocalizing when you need help, you’re grossly inefficient and you’re probably grossly underdeveloped emotionally. If you are not reaching out and interacting and communicating to the people around you that matter, and saying I need help. Shawn: Can I take something off you today that maybe you’re normally good at but maybe it’s just overwhelming to you today. Shawn: So number two on the list to be more productive is to Schedule Your Tasks Smartly. “In simple terms, don’t bite off more than you can chew. It’s good to be ambitious, but that doesn’t mean you should cramp up your schedule with lots of tasks. Try to focus on one big task each day that takes you closer to your long or short-term goals and make sure that you clear it up within the day.” What do you think about scheduling your tasks smartly, Tim? Tim: When I first saw this and you were reading it, what I thought about was setting realistic expectations. Tim: And I think that’s like a life lesson, not just for work-related. Tim: And especially if you don’t communicate those or vocalize those, they can harbor a lot of resentment things like. But in terms of productivity, I think that this is really important for setting those. The setting realistic expectation puts us in position for success. And when we were talking about the difference between productivity and busyness, this is something similar as well. And when you were really providing that great definition and kind of that clear illustration what’s the difference between being busy and be more productive, what I thought about was a sports metaphor, and football specifically. And horizontal means like going from sideline to sideline. Vertical means moving the ball down the field, right? Towards the goal line. Shawn: As sometimes they say. Tim: Exactly. And to be more productive means moving North-South, moving towards the goal line, in an efficient way. And the definition of efficient can vary, some team will take forever to move the ball down and some teams want to do it quickly. But you can move East and West or sideline to sideline all day long, but never make progress forward. And we want to make, we want to spend our energy making that progress forward. And so, with every step that we take, by setting these realistic expectations, we can move that ball down the field. Shawn: But the guy who just went three inches down the field towards the goal is the one that was actually more productive. Shawn: Getting no closer to your goal. And maybe you all the while you’re getting really further from your goal. Shawn: And we have to remember that, and that’s what he talks about in here is that you need to shift your energy from scheduling more tasks to actually doing one task a day, you’ll find that the work pile has started to shorten down slowly but steadily. And I would agree with that is that when you, when you don’t have a pile of tasks, when you schedule your tasks smartly, as he says, and you really just focus in and you’re like, “I’m not going to do 10 things poorly or mediocre. I’m going to do one thing really well today,” and that is such an empowering feeling that can be transformative in your life. You will feel that you’re instead of flustered, frustrated, overwhelmed, you’ll feel accomplished, empowered, successful by doing less, but doing it well. Tim: Yeah. Agreed with that. And I think just the final point that I have on that one, because you talked about this, you could be moving further away. Is that really every decision that we make throughout the day has an investment cost to it. It’s either a cost benefit. We’re either moving closer, or if we make the “wrong” decision, we could be moving further away. Because if we didn’t use that time wisely or didn’t make the right decision there, so I think that was solid. Shawn: There it is. So number three on the path to be more productive, Use Technology To Help. Technology, we’ve talked about this before. It can get demonized. But people are saying like maybe we should be in the Stone Age and then we’d be successful. [laughs] But in reality, these tools can really improve your productivity dramatically. Technology can be an amazing tool. When you think about like they mentioned things like Evernote and OneNote, Google Keep is another one. But like things that are good for compiling lists and keeping track of information. Those can be tremendous, like when you have like all of your things in one place, you can store pictures that you find online, or you can snap pictures when you’re in a store, and then you add it to your Evernote or OneNote. You can have your checkbox lists on there. You can have it be shared with other people, and you can use things like Trello, which you’ve use and I’ve used with groups that you share work with. And that can be incredibly effective because you’re seeing the work flow and the work sharing in real time, instead of sending things back and forth. And then there’s like he mentions, like Google Calendar, Gmail, and other G-Suite things to be more productive. I like how Gmail has gotten smarter and smarter with like kind of filtering priorities. Speaking of priorities, like I’ll have a priority inbox where it’s like the people I’ve interacted with, people I know. I think it even can tell if a decision or a time is needed, basically, so it prioritizes those over things that are not necessarily spam, but it certainly filters that too. But like things that are just like awareness kind of based emails or sales-based emails. Shawn: You may be interested in, but don’t need your reaction immediately. And certainly Google Calendar, like I’ve been using that like crazy and that’s super effective with other people, to schedule like a Zoom call. Or I can see like I don’t want to double schedule things and other people can see my calendar, and I can see theirs. So all this stuff is extremely helpful. You just have to use it in the right way and be cognizant of that. Like we talked about, these things can be distracting, like Facebook or TV, or the notifications. You just have to be smart about using them in the right way. Tim: Yeah. That’s awesome, Shawn. They’re just tools. I mentioned this one earlier, but I think that some people might benefit from like an awareness type of tool, where they see you where they’re using their time. So, that’s kind of another way. It’s not something that you necessarily have to use ongoing, but it’s just kind of an acute awareness tool, like wow, I actually spent an hour‑and‑a‑half looking through email or whatever. Shawn: Yeah. Yeah, they have those on the computer and on your phone. And you can see like the one on your phone it’s crazy. You can also see how many times you picked up your phone. Shawn: And not only just time spent on it and where you spent your time, but literally how many times you picked it up, because that can be addictive. Shawn: You’re just checking for the notifications like some dopamine disease. And you’d be surprised, it can be in the hundreds, hundreds of times. Tim: That’s crazy. For someone who doesn’t use the phone or doesn’t like to use the phone very much, that’s just appalling to me. Shawn: Right. [laughs] Let’s, see number four on the list to be more productive, Reduce the Transition Time Between Tasks. “In most cases you’ll have multiple tasks to do on the same day which are often related to completely different subject matters. For example, you may have to work on a presentation for a venture capitalist from 9:00 a.m. to 11:00 p.m. and take up production planning at 11:00 p.m. I think it means a.m.
Shawn: From 9:00 a.m. to 11:00 a.m. and then take up production planning at 11:00 a.m. So, what are your thoughts? Tim: I’m just kidding. [laughs] I think this is an interesting one because basically what it’s saying is if we have multiple things scheduled, we may not be able to actually come to a clean finish all the time. Tim: Or, let’s say in this case, from 9 to 11 I was going to work on this presentation and I finished at 10:50. Should I start something brand-new from 10:50 to 11:00 or should I just take that little short break that we talked about and kind of refresh, clear the slate, and be ready for that 11:00 a.m. meeting? Shawn: I know it’s rhetorical, but I’ll say take the break. Tim: I would say take the break as well. Unless there’s some very low-hanging fruit. Maybe that’s a point where you can just knock out an email or something like that. But I would I would take the break. Shawn: I would use that time, actually, if you’re not going to “take the break,” like where you get up and walk around or whatever, or listen to a podcast. If you only have 10 minutes, one thing that might be good is just cleaning up your work area. Tim: Literally clear the clutter. Shawn: Yeah, because that’s going to help you clear your mind and feel less overwhelmed, especially when you come back to work on whatever thing you have next. That’s kind of a re-energizer. Tim: I really like that idea. And just as kind of an exercise-minded person, that’s a perfect time to do a little about body weight exercise, take a little walk, or something like that too. Shawn: Yeah, yeah. You can do lunges or squats or you can plank, or some things like that. Tim: If you work in an office building, do the stairs or something like that. Shawn: Yeah. Okay, so number five on the path to be more productive, Eliminate Interruptions While Working. “Technology enables us—and this is what we talked about. Here’s the flip side of technology—Technology enables us to stay connected to the world at all times, but it is not necessarily a good thing. It happens a lot that you are working in full flow. Your mind is completely focused and you are actually getting things done when suddenly your phone rings.” I wouldn’t even just say your phone rings, like you’re getting a call, but like we talked about the notifications is way more prevalent. I get like 10x easily of notifications over just phone calls. So, that’s something to be aware of and we’ve talked about this quite a bit that there’s ways that you can just use some apps or switch off the Wi-Fi on your phone or go in airplane mode on your phone. Or now, if you’re savvy enough, there’s a lot of ways you can tailor your notifications. Most apps want to have push notifications turned on because they want you to interact with the app. Shawn: Of course. I know on Android you can do this. I’m pretty sure you can do this on Apple, that you can go in and just go app-to-app and say like the way you want to receive your notifications, and you can turn probably most of them off, but leave on like maybe batch notifications for some key ones. Or you can just, again, leave notifications on, but just go airplane mode when you want. And mostly I would say like where it’s the communication ones that you might want to get notifications from, like your texts or phone calls, or Skype, or something like if it’s work-related. So those ones you probably want to keep on, but again, you can just, when you’re in your mode, just switch off, go to silent or go to airplane mode, and then turn it back on when you’re done. And this doesn’t have to be all day, like we said. Shawn: It can just be an hour that you’re really focused, keenly focused on something. This is kind of like the High-intensity Interval Training versus steady or Low Intensity Steady State argument. Shawn: Like you can spend three hours doing cardio in the gym and you give me like 10-20 minutes of High-intensity Interval Training and I’ll get more done. Shawn: And it’s the same thing with work. When you’re focused, when you want to be more productive, it doesn’t have to be a long time. If you’re spending a long time, you’re probably not doing it right, and you’re not going to be more productive. Tim: Exactly. Probably getting interrupted throughout things and like that. No, that’s exactly what I thought about early on was the difference between the interval Training versus cardio. They can both work, but wouldn’t you rather get there more efficiently? Tim: And just one thing. You know, we talk about the phone, but even like email, Skype, things like that, and those types of apps can be distracting too. Tim: But like you said, a lot of us may not control. We may be working for a company or working for someone else, where we can’t just shut it down and isolate ourselves. But if you can just have an hour, maybe where you just shut those things down and really focus on the task at hand. Shawn: Going back to using technology in the right way, scheduling time on your calendar to be more productive. Shawn: To have “you time” or to have that break, or to listen to the podcast, or to whatever. You need sometimes to schedule that stuff. Shawn: So that you’re like, well, I got a call or I got an email and I got a jump on this hot thing and I can’t do what I like to do, what keeps me effective. Well, then you need to start scheduling it. Shawn: And that way, it’s there on your schedule and it’s blocked off, and therefore most likely it will happen. So, we’ve talked about this one a bunch and I really like this one. I’ll let you let you take number six. Tim: Yeah, number six on the list to be more productive is Batch Similar Tasks Together. I think we talked about this, specifically as it relates to email, quite a bit. That, you know, a lot of people check their email just constantly throughout the day, probably more than their phone even. Tim: It’s kind of like back and forth, back and forth. And so this, the idea behind this would be that it would be ideal to just say I’m just going to spend this chunk of time on my email. And preferably, if you ask most people, preferably not the first thing you do at the beginning of the day. Tim: Because then it can just lead down that rabbit hole of different things, or you’re just constantly distracted and things like that. But anyway, the phone calls could be another one that you focus on. Batching even your social media time would be something to do, as well. So, the whole idea of batching just means to take one task or like a umbrella of under one task and do that at one time, as opposed to littering it throughout the day. Because remember, you’re leaking time and productivity if you keep going back and forth between things. Shawn: And it’s really like we’ve talked about the book quite a bit, and Tim Ferriss quite a bit, The 4-Hour Workweek. It’s essentially, if you were to boil that book down to one sentence, it would be this sentence, like it’s batch similar tasks together. Like he talks about that you check your email twice a day, that you don’t check it first thing in the morning, so you don’t become fire-driven, that you get to be more productive, a big task done at the beginning of the day, then you feel accomplished. And then you roll into your emails, and then you’ll check it maybe again four hours later. But you check it twice a day. And then he schedules all his phone calls for one chunk during the day, to be more productive because he’s batching and he actually, when he does his phone calls, he’s doing grounding, like barefoot outside or he’s going on a walk, or whatever, so it’s even more effective. And like when you’re walking, you feel re-energized, you feel more alert. So that’s better for your phone calls. But when you’re doing your phone calls like this, then you’re not thinking about, “Oh, I gotta get back to this email. I got this other thing that’s looming.” No, you’re like, “Nope, this is my phone call time. I want to focus on phone calls and I’m going to really connect with people. I’m going to listen,” because listening is a lost art. Shawn: And it’s extremely important. And then, again, if you’re someone that when you get to work first thing you check your email and you just go into just deleting whatever’s not important, and then you’re chasing fires and you almost become like hungry for fires. And you’re creating drama where there isn’t any drama. Because there are days where there are fires, but there are days when there isn’t, but you’re making things seem dramatic even when they’re not. And it can be an addiction. It’s really an unhealthy addiction, and it happens a lot in business. You can kind of judge the pulse of the office, like when you walk in, but if there’s a tenseness, that drives the office, then then a lot of that drama is actually created. Shawn: A lot of the urgency is created. And it’s important to recognize like that box we talked about where things are important and urgent, but a lot of the times these things aren’t urgent, and they’re not important. And so it’s important to recognize that. Tim: Yeah. I think that quote from Eisenhower, President Eisenhower up here is what is, “What is important is seldom urgent, and what is urgent is seldom important,” and that’s kind of what you’re alluding to there. Tim: Yeah. And you basically said that same thing right there. Shawn: Well, he said it better, so props to him. Tim: More succinctly, I don’t know about better. Shawn: [laughs] Props to Eisenhower. Tim: The only other thing I would mention here, too, Shawn, is that this batching concept is not just specific to work. That’s also like from a health nutrition standpoint, cooking. Shawn: Oooh, yeah, yeah, yeah. Very important. Tim: Like in the evenings, I do some batch cooking, where I not only cook for the evening but maybe prepare lunch for the next day, or things like that. Or a lot of people do a lot of batch cooking on Sunday. Tim: Where they prepare a bunch of food for the week so they don’t have to spend a whole lot of time each day doing that. So, just another way to be more efficient. Shawn: Phenomenal point. I love that, Tim. Yeah, and that could be like you could even have your family contribute to your batching, right? Like you could have Sunday be like your clean up the house day. Shawn: And get your whole family tasked with that and you all kind of do it together, and it’s something that it’s not like you feel like it’s just like you’re alone in this and you feel like it’s your punishment. But it’s like you can make it fun where you turn up the music in the house and everyone just, you open up the doors and everyone’s just kind of cranking and cleaning. Tim: That’s a super point. Yeah. That stuff can be fun. Shawn: Yeah, all right well this is it. Tim: [ghoulish voice] The last on the list to be more productive, number seven. Shawn: Conduct meetings effectively. Woo! This is a big one. I’m going to say it’s frustrating when people show up late to meetings, when people cancel meetings. It’s really important that you go through your meetings, you say this meeting is necessary and here are the people that need to be there, and here’s the time it needs to be allotted for, and we’re going to keep to that. And we’re going to honor everyone else’s time and honor their importance and show up on time, not late. I mean, maybe it’s the old thing like where “On time is late, and late is not acceptable,” or so something like that. Shawn: I forget what it is. It’s kind of like a military thing. But I agree with that. Like you show up on time and you also end the meeting. Like it shouldn’t linger an extra 30 minutes. If so, I’d like to end the meeting, say “Look, we’re going to have to schedule another meeting, and if it’s going to run long like this consistently, we’ll start scheduling the meeting an extra 30 minutes. But we have to question why it’s going long.” So, that’s something to think about. I really feel like the meeting thing is important and underappreciated, and a lot of time is wasted there. But there’s a lot of disrespect. Shawn: I feel that there’s a lot of disrespect. If you’re going to schedule a meeting and you want it to be more productive, show up for that meeting, show up on time, and don’t waste other people’s time. If you think about it, it’s crazy at a lot of big companies, like how many big salaries will be sitting around a table, essentially, and you’re wasting time, you’re showing up late, you’re going long. Sometimes there’s people in there that shouldn’t even be in there. And it’s just crazy to me. Meetings can be highly effective, that’s why we have so many of them and we put our heads together, like great things can happen and we can be more productive. But it can be such a time-waster, too, and so disrespectful. You need project managers, you need people that are scrutinizing meetings often, re-visiting the need for the meeting often, the way the meeting’s set up, the time the meeting’s allotted, the time that it’s at, to meet, where you’re meeting. You need to think about all that stuff. Tim: Yeah, that’s a super point. And I think just in my experience, by having clear agendas and outlines of what is expected to be covered is important. But to me, one of the biggest things is what I see wasting time is that there’s no action item. A lot of times there’s no action items taken or clear direction, like clear outcome of meetings, in my experience. And that’s something that’s frustrating, those types of meetings. You should always come away with something. Tim: Not just feeling good about having a conversation. You can do that anytime. But just to have some clear takeaways. Shawn: Right. It’s not just pontificating. Shawn: Yeah, you need a summary at the end of the meeting, “So, here’s what we discussed, here’s the summation of that, and here’s the action items for each of the people in this room that we need by the time we meet again,” or by some in a certain time. To that point, a lot of times those action items don’t happen until last second of the next meeting. Shawn: That’s an interesting psychological phenomenon, too. And if you’re creating action items, you might be cognizant of that, that you say, “What’s the timeframe that you can get this done?” And if it’s one of the more urgent, going back to urgency and importance of those items, “Can you get it done by Thursday? Can you get it done by blah- blah-blah?” You know, instead of just leaving them as open action items, because if you leave them that way, then they’re going to be done last second by the time you arrive at the next meeting. Tim: Yeah, that’s a super way to end that. Shawn: So that is the way to be more productive. Shawn: [chuckles] 7 Hacks to be more productive. And I think this is a good list, and especially I think if you’re in the workplace, you can benefit a lot from this. But Tim even came up with some great life applications here, too. So, we really appreciate you guys listening to the podcast and you can go to BioTrust.com/VIP to interact with our community, the Facebook community. It’s a highly interactive group and I think you can find like-minded people there. We’re also BioTrustRadio.com, if you want to tell your friends about this podcast and listen to them. And please check on BioTrustRadio.com, you’ll see all the transcribed notes. You’ll see links like we were talking about, like the video with Al Pacino, and links to articles and products that we mentioned, citations. All that gets listed in these notes. And we obviously appreciate if you’re listening on iTunes, Google Podcast, Stitcher, Spotify now. 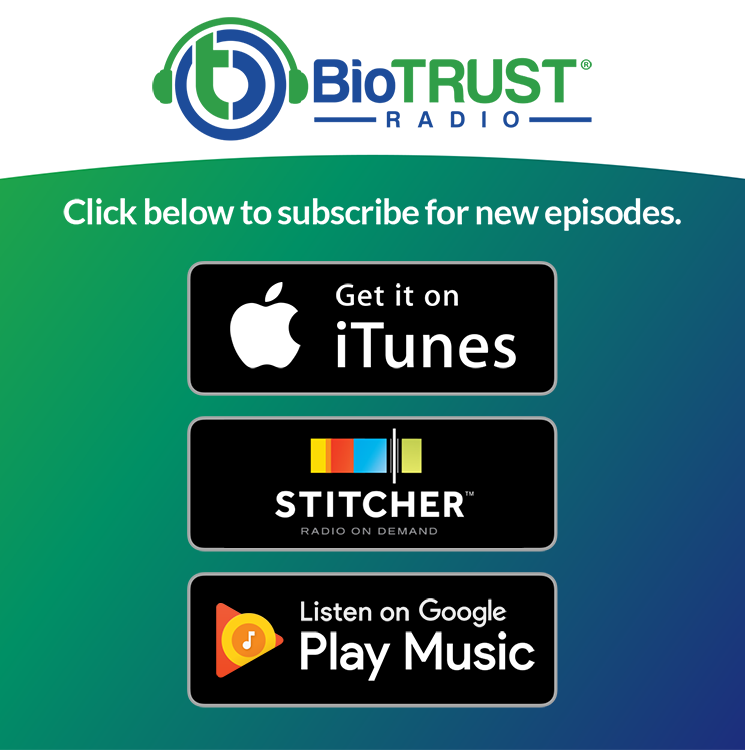 So, obviously that’s great, if that’s where you listen to podcasts, but just know that there’s more to be had if you want to dive a little deeper on our website, BioTrustRadio.com. So, we really appreciate you guys listening. Thank you. Tim: Thanks for tuning in, guys.